Entrance at 2 E 65th Street, between 5th Avenue and Madison Avenue on the south side of the street. Enright House opened its doors on June 18, 1929. For four years the Lobby remained just as Howard Roark had envisioned it. In 1931, Enright enlisted the services of his friend Alfred Barr (director of MoMA) to become his art consultant and curator. By 1932, Enright had grown bored with what he referred to as a lifeless lobby – he wanted color and art. For the lobby makeover Enright enlisted San Francisco based designer Frances Elkins. Work began in April of 1933 and was finished on September 2, 1933. 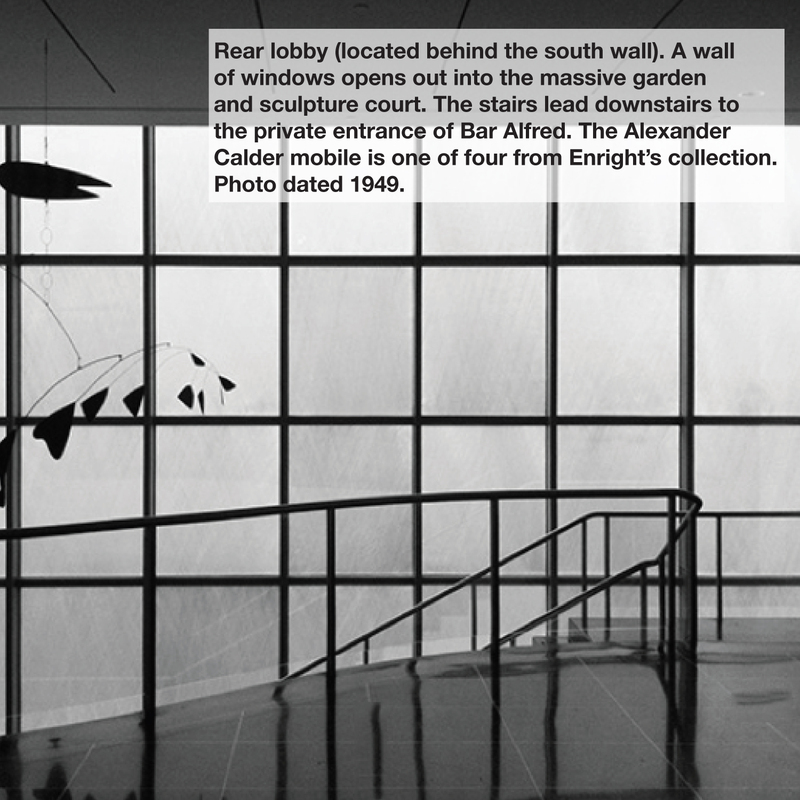 The new lobby became an adjunct gallery of works from Enright’s ever-growing collection. Elkins added a fountain for background noise, color and movement. She had the exterior grill work that faced the interior courtyard reproduced to create pattern and divide the space with a bit more mystery. 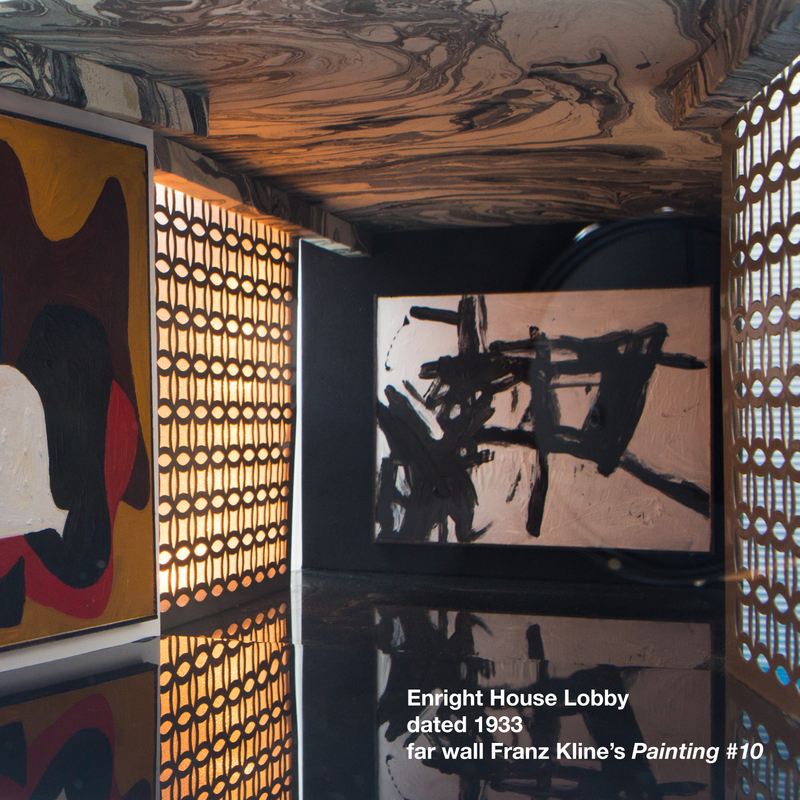 Elkins said, “Enright House changed the way I work with scale and proportion.” Elkins created the unexpected with a canvas ceiling painted off site in silver, black and white. Although Roark was mortified by this element, he never voiced his opinion to Enright. Residents always were delighted with the ever-changing display of art in the lobby. Enright would have his preparators begin at 2 am and work through the night so it always appeared magical and effortless. 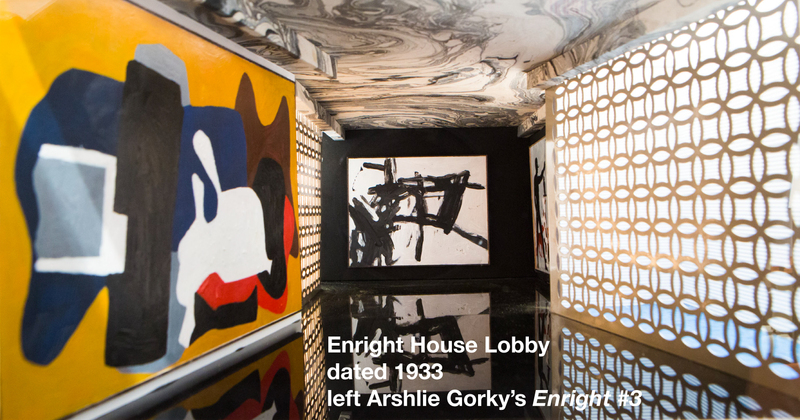 In 1932, Barr introduced Enright to the work of Arshile Gorky. Always fascinated with the new, Enright commissioned Gorky to create five large scale murals for Enright House. Each mural measured 18’ high by 25’ long. Gorky and Enright became life long friends until Gorky’s unexpected death in 1948. In 1945, Enright, once again, commissioned Gorky to create the murals for Bar Alfred. Designed by Frances Elkins in 1933. The ceiling height is 22’. 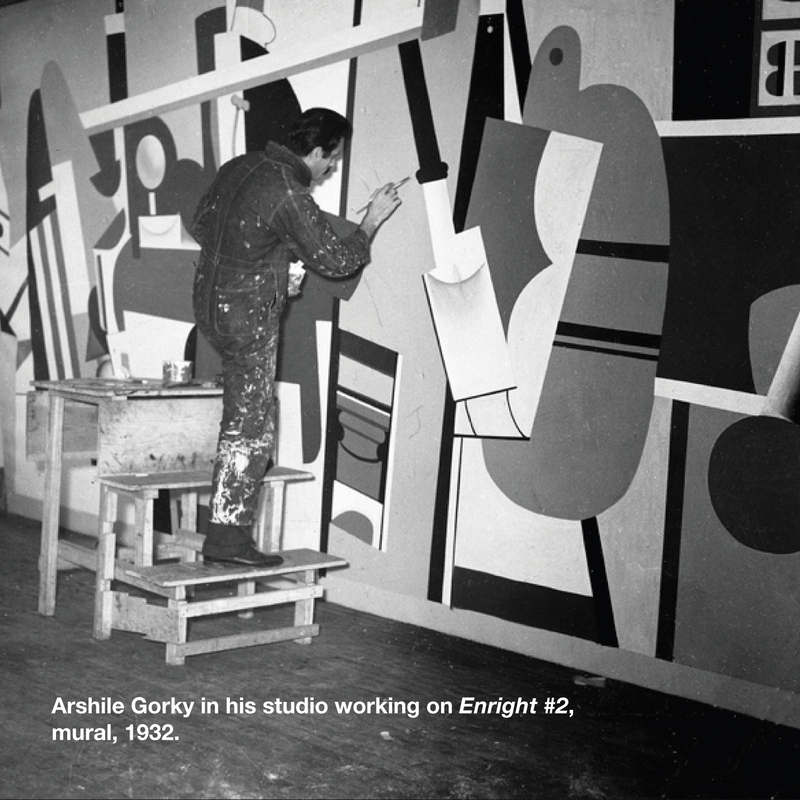 On the west wall hangs one of five massive murals that Arshile Gorky created for Enright House titled Enright #3. 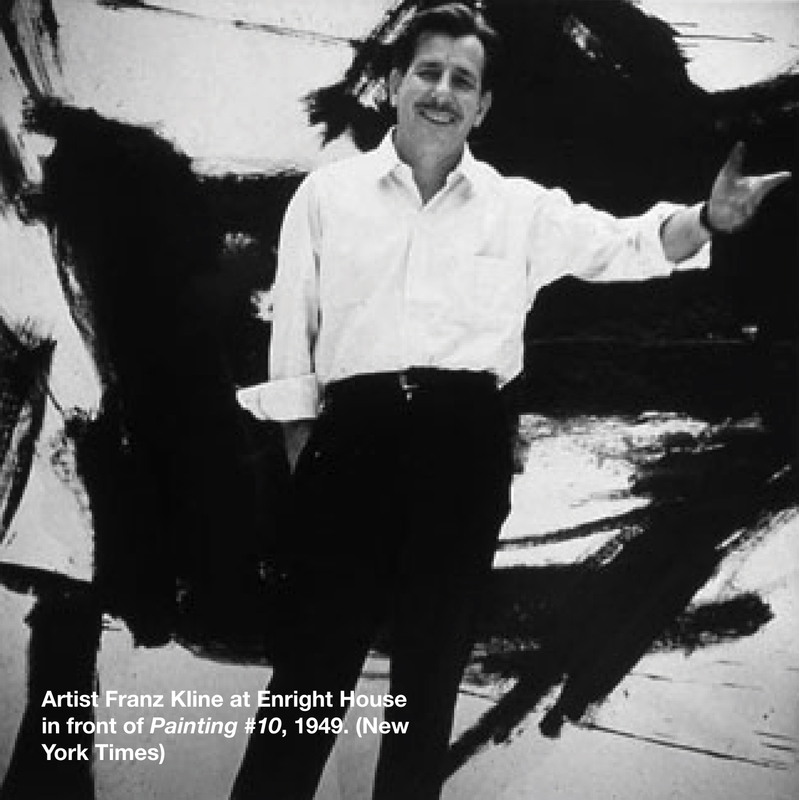 The south wall features one of the largest Franz Kline works ever painted titled, Painting #10. On the east wall hangs Francis Picabia’s Animal Trainer, oil on canvas, 1923. The floors were highly polished black granite. The rear lobby walls were covered in a canvas and silk wall covering woven especially for this project. It was very thick (perfect for rehanging art), yet it had a beautiful subtle shine to it. Enright disliked ornate frames. His rule was frames had to be flat, thin and generally painted black. 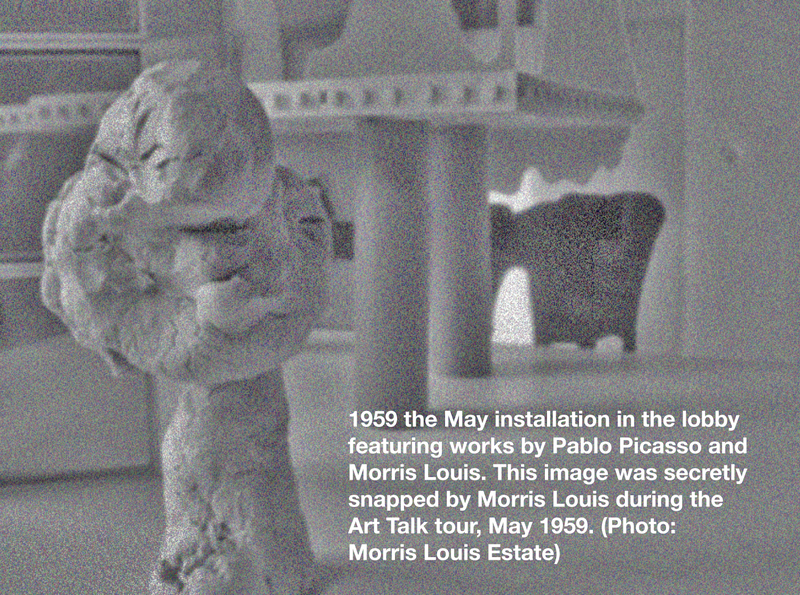 Beginning in 1945, once a month Alfred Barr and Roger Enright would give “Art Talks” for students, faculty and members of The Art Students League of New York. The “Art Tours” always began in the lobby and continued out through the sculpture court and would end at Enright’s Private Gallery. The Talks were held to capacity at 25 people. At any given time the League would have a waiting list of 400 or more members vying for a coveted spot on the tour. Depending on what works were being exhibited at the time, the artist were know to be on the Tour as well.